The air-conditioning and ventilation control system, with its proper installation and configuration, improves the environmental conditions within the premises, reduces the cost of resources, and effectively controls the parameters of temperature, air and humidity. Selection of optimal settings based on changing air parameters inside and outside the building. 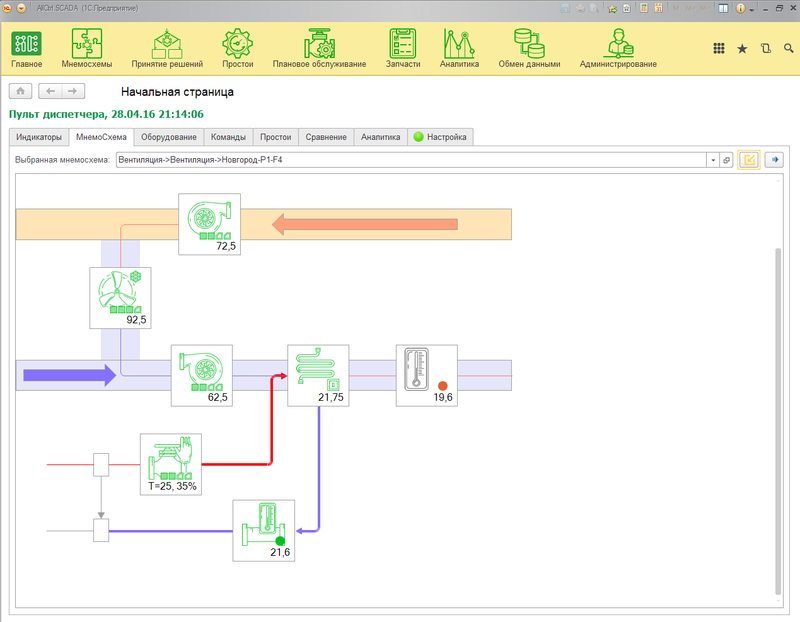 he equipment and sensors of the building/production ventilation subsystem are connected to the ACS AllCtrl.SCADA based on 1C, and are displayed on the mnemonic diagrams of the system. Based on information received from sensors, ACS automatically decides on the necessary power of recuperative heat exchangers, compressors, air heaters and other equipment included in the ventilation subsystem, manages ventilation equipment (opens/closes the hot water taps, switches on/off pumps, controls the power of motors, etc.). The assigned sequence of algorithms ensures the correct work of the sequence in case of changes in air parameters, in the event of unforeseen situations or in case of failure of any of the subsystems. Hardware-software complex AllCtrl.SCADA based on 1C monitors the occurrence of such emergency situations as: power outages, pollution of ducts and fans due to debris, voltage drops, damage of the sensors. If reqired, our company may supply the necessary sensors/devices and implement a "turnkey" project to automate ventilation control of your premise/business centre.